Mara L. sent me the details on this “Cobra Kai” cake inspired by The Karate Kid that she made for her “very mature boyfriend Josh’s 34th birthday”. Nothing says “love” like sarcasm, eh? Josh must be a very lucky guy. Just kidding, Mara. I bet Josh was too enthralled with his cake to notice you berating him. I’m sure he’s doing just fine. it was devil’s food with chocolate frosting dyed black. 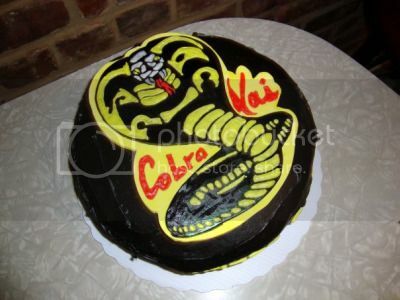 Cobra Kai symbol was made out of fondant and piped with royal icing. 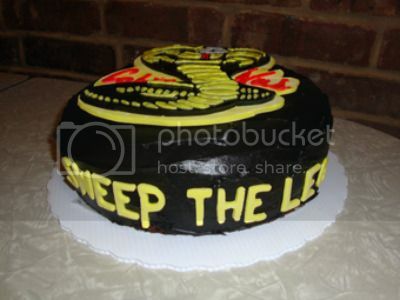 …and the “SWEEP THE LEG” quote adorning the side of the cake was crafted with fondant and flavored with Daniel Laruso’s tears.